Indiana DeLorme Atlas: Road Maps, Topography and More! Check out the wineries near Madison! 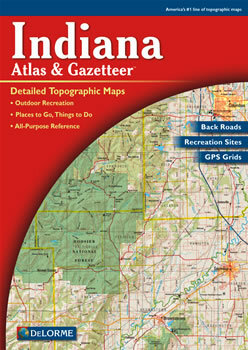 Make the DeLorme Atlas and Gazetteer the travel guide for your next vacation to Indiana! The atlas has 47 large pages of shaded relief maps with an index of place names and map features. The back cover of this atlas has a large map of Indiana with an overlying grid. Each cell of the grid contains the page number for a detailed map of that area. The detailed maps in this atlas show physical and man-made features that include: rivers, creeks, lakes, forests, wetlands, reservoirs, public lands, back roads, cities, towns, railroads and airports. Plus, state-wide topographic information is shown by contour lines with intervals of 60 feet. This atlas contains 17 additional pages of reference information for Indiana's activities and points of interest. These attractions include: state lands, national lands, covered bridges, nature preserves, wineries, unique natural features, hiking, biking, scenic drives, fishing, hunting, campgrounds, canoe trips, historic sites and wildlife viewing. This is not your ordinary map. The DeLorme Atlas and Gazetteer is a collection of topographic maps, a recreation guide and travel planner in one convenient book!